Just when you think that technology has already reached its pinnacle for helping us in making smallest of decisions, here comes another surprise. 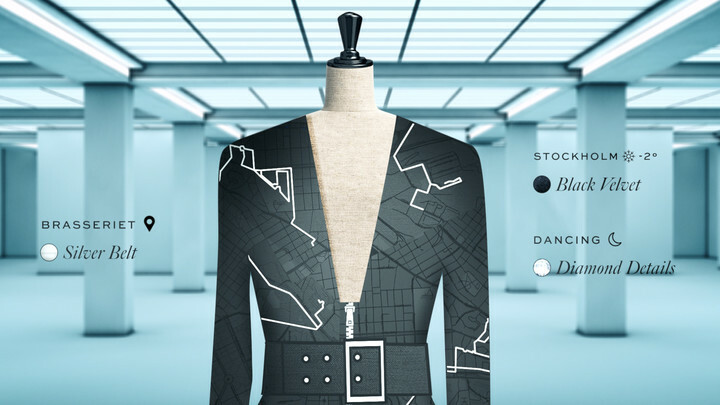 Google and the famous fashion brand – H&M – have come together for a new app dubbed as Data Dress. The idea of the app is to help you with custom clothing by analysing your lifestyle, activities, hangouts, and the weather. It examines your routine and surroundings around you or what gathering you’re going to attend and based on such aspects, it suggests a custom dress. At the Google Developer I/O conference last year, the tech giant unveiled an Awareness API, which utilizes all the sensors available on your device to get every possible information. At that time, Google did not reveal much about what’s coming in the future. With the advent of this new app in collaboration with H&M’s digital fashion house Ivyrevel – we can see how things are panning out. We have already seen some great implementations of the API in obvious scenarios, such as shopping for a new home in the neighborhood or recommending a music playlist while starting a jog. For New York Fashion Week, we explored other creative integrations of the Awareness API and collaborated with H&M Group’s digital fashion house Ivyrevel and its Fashion Tech Lab to bring couture into the digital age with the ‘Data Dress,’ a personalized dress designed entirely based on a user’s context signals. It is not yet clear how the app works and how does it analyse the available user data. However, based on the images, we could expect that the custom dress will be designed as per the theme and type (formal or social) of the occasion. Also, it will be according to the weather. For example – if you’re in Miami then the dress will be made from the fabric that is suitable for summery appearance. By making use of all the sensors available on your device, the app will detect the surrounding and your activity. It will know if you’re driving or cycling or maybe just out for a walk. It will make use of GPS and detect your location and will present to you a dress that will be according to the place, occasion, trend, and comfort. It does intrude into your privacy by collecting every data about your lifestyle, but hey, you have to compromise on privacy if you want a custom dress designed with the expertise of H&M. For now, the app is in its closed alpha stage, but Google will soon be launching its beta version by the end of this year. Regarding the pricing of dresses that will be available on the app, Ivyrevel says that the starting price for a dress would be somewhere around $99. It would be pretty exciting to see how the app works and how many users would be willing to give it a try. Curious ones can also sign-up for the beta trial before the app goes official. In the meantime, we would like to know if you would give “Data Dress” a try whenever it goes official? Share your views through the comment section below.